After the almost 12-year American occupation, there has been a lot of speculation on the future of Afghanistan. While some have deemed the war “unwinnable”, others have talked about responsibility specifically in terms of Afghan women. Upon the close withdrawal of American forces (if they do not delay it again), Canadian and American media articles continue to inquire on the future of Afghanistan without Western guidance. Common depiction of Afghan women. Via the Guardian. In an attempt to justify the importance of Western presence in Afghanistan, some articles rely on showing Afghani men and women in opposition to each other. Not only that, but soldiers are constantly depicted as attempting to bring Afghan women to trust them. Another example is shown through coverage of Aisha Bibi’s case, which MMW discussed in 2010. The romantic idea of the invader attempting to bring the non-Western, non-Christian, non-democratic and “primitive” women to collaborate with them (often against the non-Western, non-Christian, non-democratic and “primitive” man) reminds me of the colonial rhetoric of the noble savage. Khan, who asserts that if women gain the right to vote and education then the occupation was not in vain, says that, in her consultation with Afghan women (we do not know which Afghan women), she came up with four conclusions. First, female leaders should be supported in negotiations with the government. Second, women should be able to vote. Third, local imams should be compelled to support women’s issues. And finally the U.S. should financially support Afghani women’s projects. The latest coverage regarding women’s issues in Afghanistan bothers me because it does not really give many options. It seems that if it is not Western intervention, Afghanis cannot do much for themselves, which again resembles colonial discourses. And can we consider ways that foreign intervention may have actually caused harm? Just as Krista questioned Canada’s claim to protecting Afghani women in 2009, I continue to emphasize the need to question America’s real motives, which have always had more to do with the “war on terror” than anything else. If the U.S. wanted to “save” women, they could support women’s organizations around the world and also call attention to the oppression of women in other countries including their beloved neighbor Canada and their relationship with aboriginal women or their ally Saudi Arabia and women’s rights. Moreover, I think it is quite important to recognize that reconstruction is a process where gender relations will be shifted, changed and re-arranged. Yes, there is a lot to do. Afghanistan remains the most dangerous country for women today and education for both men and women may be the only way to end prevailing domestic violence. RAWA demonstration in Pakistan. Via Indymedia Scotland. Yet it is important to remember that the neither the U.S. not Canada went there for the women. There has been little improvement in women’s situation from the point of view of the invasion and there are those who say that the situation has worsened since the military intervention. The situation in Afghanistan is part of a historical reality of numerous interventions that have affected women and men. And American and Canadian interventions did nothing but just bypass human rights issues to focus in military success. I disagree with Khan in the role that she sees that West playing. On the contrary, I believe that it is time to hand the country back to its people, with no expectations of “perfect Afghani women” and no further money for weapons. The intervention did not “save” women in almost 12 years, as Sana’s post recently discussed. 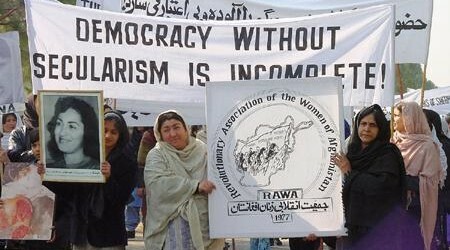 A lot of the fight for women’s rights has been carried by, at times controversial, activist groups in Afghanistan that existed even before the U.S. came along, RAWA and Voice of Women Organization, being some of the examples. Perhaps even shoving the colonial rhetoric along with condescending discourses will be more help than bombs, soldiers and military funding.